Make a bold statement in your dining room with some beautiful leather dining chairs. Upholstered in 100% genuine leather, and with sturdy solid oak legs, all of our leather chairs are built with durability in mind, allowing you to enjoy them for many years to come. At Oak Furnitureland, we never cut corners where quality is concerned, which is why each chair is made using only the finest cuts of solid hardwood, selected for their superior grain patterns and golden colour tones. And, with padded leather seating, your dinner guests will still be sitting comfortably long after dessert is served. Our beautiful leather dining chairs come in several gorgeous shades and styles. Looks like the classic, braced scroll back can fit perfectly into both contemporary and traditional kitchens and dining spaces, whereas the scroll back works best in modern spaces with its distinctive shape. Stunning chocolate brown and inky-black leather dining chairs work particularly well in modern dining rooms with dark or neutral colour palettes, whereas rich cream leather dining chairs look fantastic in brighter, more feminine spaces. 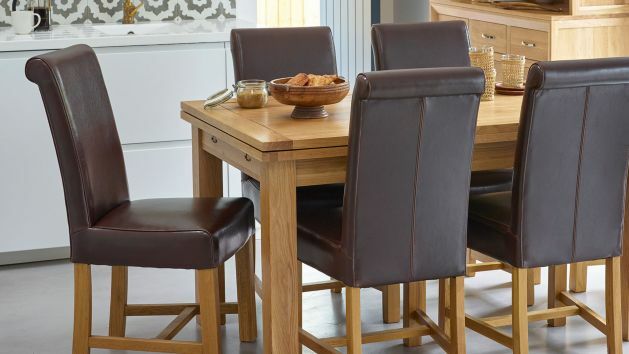 If you’re looking for a matching dining table to go with your leather chairs, then you can mix and match styles using our handy dining set builder, which is designed to help you get your creative thinking cap on! Or simply browse our range of complete sets of dining table and chairs. Unsure of leather? We also sell fantastic fabric dining chairs, mango and painted dining chairs and seats made with material like woven grass. Genuine leather is naturally hard wearing and resilient, however, a little extra care can keep it in optimum condition at all times and help extend its lifespan too. Pick up our premium leather care kit, which includes a leather cleaner, leather protection cream, and absorbent cloths and sponges, and you can clean away marks and protect your furniture with ease. To keep your solid oak legs looking tip top, we recommend applying a clear wax furniture polish every three months or so. This will not only enhance the natural beauty of the oak’s golden hues but nourish and protect the wood, allowing you to enjoy your furniture for longer. Purchase your stunning leather dining chairs with peace of mind that you can enjoy free home delivery, to any room of your choice. We’ll even give you a call 30 minutes before we arrive, so you know when to expect us.